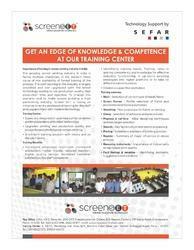 We provide services, education and training in screen printing under aegis of Screen SET Pune. As the growing screen printing industry in India is facing multiple challenges in the modern times cause of non-availability of formal training of the process. The staff working in the industry is largely unskilled and not upgraded with the latest technology leading to low production quality, high production time and rejection. To change this scenario and to make screen printing a high performing industry; Screen SET is taking an initiative to lend a professional training for the staff and upgrade them with modern technology. Looking for SCREEN PRINTING TRAINING ?